Very few times has happened that a poet, with only twenty-four lines of a poem, was able to describe with so much accuracy a bird and the habitat where it is located. Giovanni Pascoli with its very short poetry l’Assiuolo (the Scops owl), has been able to immortalize this small owl so much common in his native land, with the mastery of a perfect ornithologist, adding that emphasis typical of a poet attached to his land and to the sounds that have accompanied his youth. 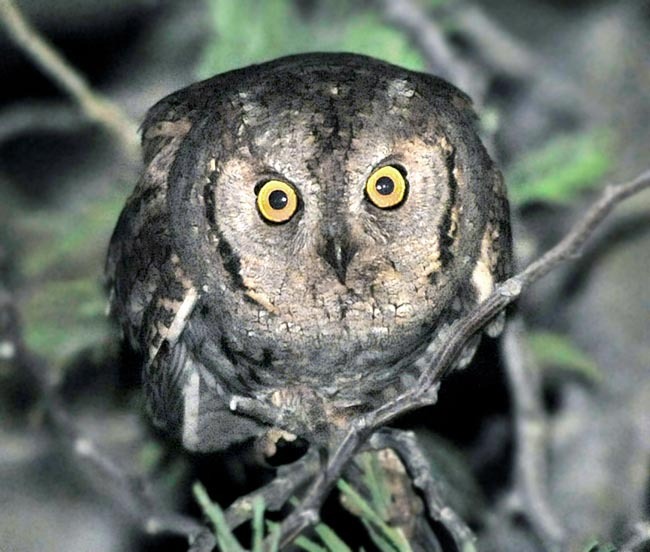 Also Umberto Saba and Pierpaolo Pasolini cited the scops owl in their poems but not only poetry has been involved by the characteristic voice of this small strigid but also the cinema has made it a character in the Harry Potter saga. The Scops owl (Otus scops Linnaeus, 1758) belongs to the order of the Strigiformes and to the family of the Strigidae and is the smallest Euro-Asian member of this family after the Pygmy owl (Glaucidium passerinum). There is no night in the Mediterranean area that is not crossed by the mourning sound, persistent and penetrating of this small bird. The constancy of this song is awesome. Entire nights spent emitting, with a constant rate of a few seconds, this mourning chiù chiù, with often different resonance, seen that it uses to sing rotating continuously the head, muffling the voice from time to time and rendering almost impossible to identify the point from where it is emitted. Maybe it is due to this persistency, read as innate stubbornness, is at the origin of a popular saying that correlates the scops owl head to a cabbage head. As for the Swallows (Hirundo rustica), the Common cuckoo (Cuculus canorus) and many other migrating birds that annunce with their arrival the good season, the countrymen do not forget to cite it in a proverb they have that recites: “quando canta l’assiolo contadin pianta il fagiolo” (when the scops owl sings, the countryman plants the bean). The onomatopoeic origin of the Italian vulgar name is evident but does not have any relation with the term Assiolo that is on the contrary a diminutive corruption of the Latin asio – auses = ear, to rightly indicate a characteristic of this small owl. 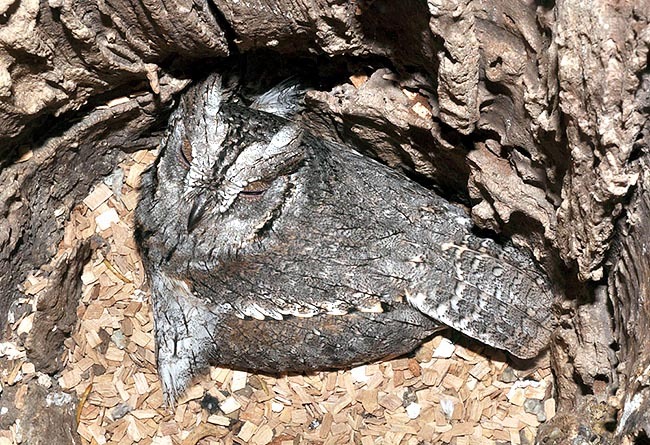 Common names are Assiolo in Italian; Scops owl in English; Zwergohreule in German; Hibou petit-duc in French; Mocho d’orelhas in Portuguese and an odd Yo-roppakonohazuku in Japanese. Also the etymology of the scientific binomen describes with precision its morphological characteristics. Otus from the Greek “otos”, synonym of asio = ear, due to the auricular tufts, whilst scops from the Greek “skops” that indicated a tiny owl with small ears. Others think that scops derives from the name of the mount Scopus that overlooks Jerusalem where this bird is quite common during the summer. The scops owl is an Euro-Asian strigid that occupies the whole Mediterranean area, the Middle East, the continental Russia and along the Asian temperate belt till to touch Mongolia. It is present in isolated way also in the Indus Valey in Pakistan and in the coastal belt of Iran of the Caspian Sea as well as of the Persian Gulf. It is absent in the continental Europe, in England, and in the Scandinavian Peninsula. Although present in almost all France, is particularly rare in correspondence to the north-European slope of the Alps. In Africa, on the contrary, is present only on the western coasts of the Mediterranean and is absent from Libya up to Middle East. The scops owl does not have a constant diffusion on its territory and often shows a spot presence at times with good concentrations and others with very rarified populations. It’s a long-range migrant and all the populations hibernate in the African sub-Saharan belt whilst only some groups, considered as sedentary, hibernate in the south of Spain, of Greece and of Italy. It reaches the reproduction territories during the month of April and leaves them already in August. Very loquacious in the summer areas it is practically silent in the winter territories. Some subspecies have been identified, belonging to some isolated areals, in particular Otus scops cycladum that lives in the Cyclades Islands in Greece, Otus scops mallorcae of the Balearic Islands, Otus scops cyprius of Cyprus Island and of the Near East, Otus scops turanicus of Central Asia and Pakistan and Otus scops pulchellus pulchellus from Caucasus up to the eastern limit of its areal, Otus otus otus in the remainder of the Mediterranean area. The Mediterranean scrub is typically the site preferred by this small owl where it finds ample shelter during the day and good spaces for its hunting activity. It much loves places with big and old trees in whose holes often finds shelter and the place for nidifying but at times prefers also places of low bushes where it remains among the branches and camouflaged in the dense creepers. It lives also in olive groves, cultivated fields with small woods, small forests of conifers and at an altitude up to 2000 m, in sparse woods of deciduous trees. It does not disdain the proximity of the human beings and it is not rare to find it in cemeteries and in old city gardens. In the winter sites it lives in bushy sparse and dry thickets, at times at the limit of desert areas. The scops owl is a basically nocturnal bird and usually lives isolated, especially in the nesting period, even if during the migrations it may gather in small groups. At times, it may be accidentally heard singing also by day but its activity is purely nocturnal with beginning just after the sunset and after a break of a very few hours in the middle of the night, up to the sunrise. If surprised out during the day on its roost, it assumes the typical position of a dried branch, stretching to the extreme the body and leaning to the nearest trunk. Usually it doesn’t have aggressive behaviors, but, like many strigids, if menaced and without any escaping possibility, beats strongly the beak, dramatically opens the eyes, hisses and blows spreading its wings in order to scare the intruder. Unlikely the pygmy owls, it has a direct and little waved flight, absolutely silent and close to the ground. 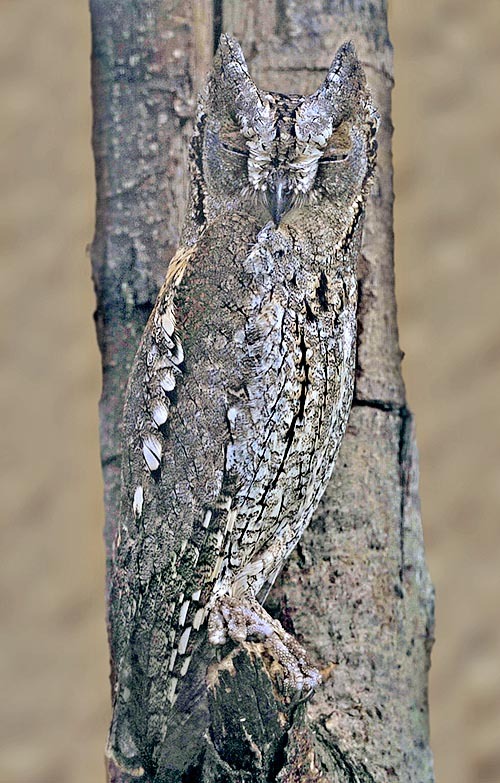 The alimentation of the scops owl consists mainly in big insects it catches flying or staying on the trunks or directly on the ground under the sources of illumination. Grasshoppers, large moths, cockchafers, beetles and cicadas are its preferred meal even if it does not disdain hunting also earthworms and some small bird, in particular nestlings. 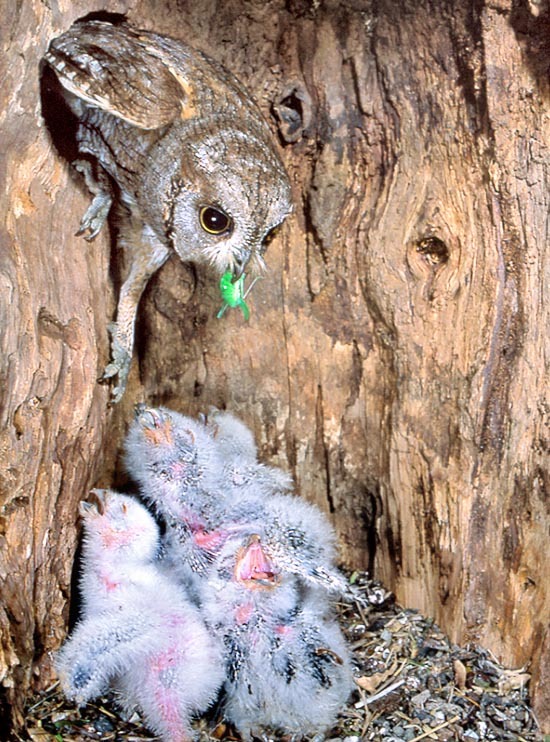 Also the scops owl expels pellets in which contents are collected the elytra and the non-digestible parts of the hunted insects. The road illumination is by sure one of the very frequented places as well as the lights placed on the tombs in the cemeteries around which fly crowds of moths. As it has been already shortly mentioned, the scops owl is one of the smallest Euro-Asian strigids reaching barely the length of 20 cm, measures equal to those of a large thrush. Conversely, the wingspan is discreete seen the necessity to perform long migrations, with a measure reaching the 50 cm. The weight may exceed the 100 g.
As it is reiterated in the scientific name, this small raptor is equipped with two very thin auricular tufts and usually formed by six feathers that, when stretched, reach the three cm of length but that usually keeps folded on the head making it appearing at first glance a small pygmy owl. The colour of its livery is the most camouflaged imaginable. A finely spotted plumage and striped by many shades of grey, brown and black and spotted by white spots on the alar cover as well as on the body. The facial disk is little pronounced and slightly marked by a paler border with two usually lowered tufts. Bright yellow eye in the adults whilst the immatures ares slightly amber. The young livery is few more prominent but very similar to the adults. When leaning on a trunk, in its mimetic posture, is practically invisible. The scops owl nidifies starting from the month of April upon the return from the African wintering, with extension up to late June. The couple forms on the arrival with the choice of the new partner who is always different every year and after having identified the suitable place where to put the nest, begins almost immediately the laying. On the contrary, the sedentary populations of south Mediterranean nidify also since the month of February. The nest is not built but it uses holes in old trees without adding any material to the existing substratum. It may also nidify in holes of old constructions and at times also in old nests of corvids. Also the specially prepared nestboxes are often frequented. 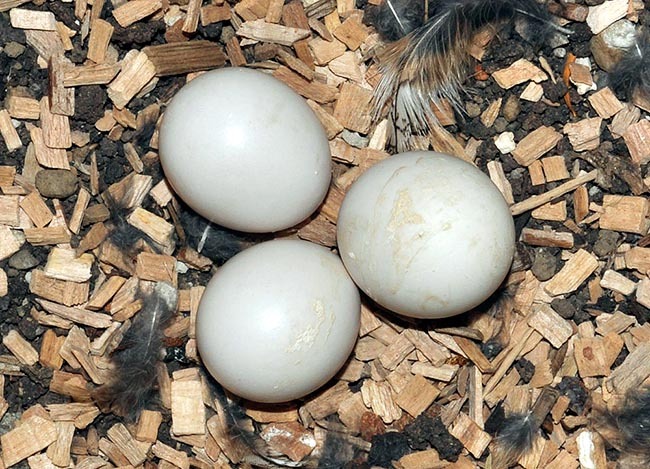 The brood is usually formed by three to six white eggs, of fairly round shape and the hatching, done by the female only, lasts about 25 days. 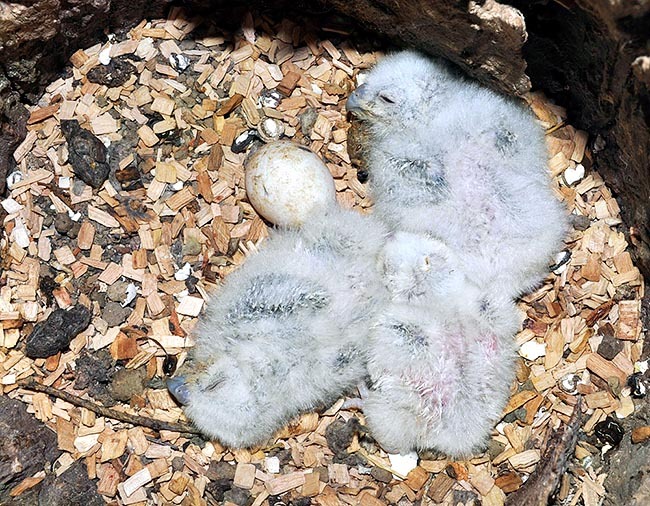 The chicks remain in the nest for three weeks after which they leave it, even if they keep not far, up to the fifth week, when they are able to fly. The total independence from the parents is reached when about 10 weeks old. It is not exactly know the maximum age this small nocturnal raptor can reach when free but there is a report of a more than 12 years old case. The species, although in marked reduction, is not considered as endangered.